2/17/17 addendum-3 released: Addendum regarding schedule of events . 2/10/17 Addendum-2 released: Addendum extending RFP Closing until 2/13/17 @ 4 pm. 2/6/17 Addendum Released: For those responding to the CM – RFP, please see the attached addendum. 1/24/17 Committee Meeting: Wednesday morning we will be having a Police Facilities Committee meeting at 9:00 am in Torrent Hall. These meetings are open to residents and the public. Please see the attached links for the upcoming agenda. Thank you. 1/22/17 Union Leader Article: by Jason Schrieber covering the budget committee meeting on January 17th. 1/20/2017 Budget Committee votes in favor (5-1 abstention) to recommend the Proposed Police Station Warrant Article 14. 1/17/2017 Interview released: This video answers several questions regarding the proposed police station as well as informs voters on the project. 1/13/2017 RFP for Construction Management Services released. Submissions are due by February 10th, 2017 @ 12:00 pm. 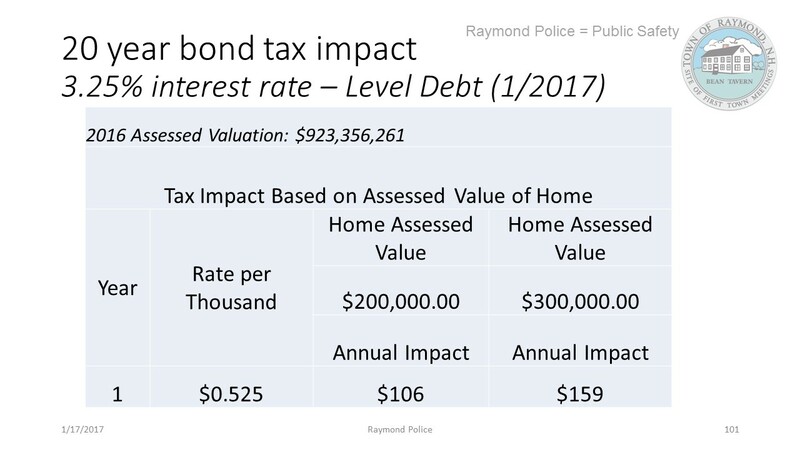 1/12/17 Budget Committee Presentation: Chief Salois presented proposal to the Budget Committee which can be viewed at RCTV (Forward to 1 hour 50 minutes). 1/12/17 Committee Meeting: Thursday morning we will be having a Police Facilities Committee meeting at 9:00 am in Torrent Hall. These meetings are open to residents and the public. Please see the attached links for the upcoming agenda. Thank you. 1/9/17 Selectmen voted unanimously to support a 20 year bond – Level debt – as we move forward with the proposal. The tax impact would be $.52 rate per thousand. See illustration for cost per household. 1/5/17 Driving by the Safety Complex you may notice a new sign installed today on the proposed site. 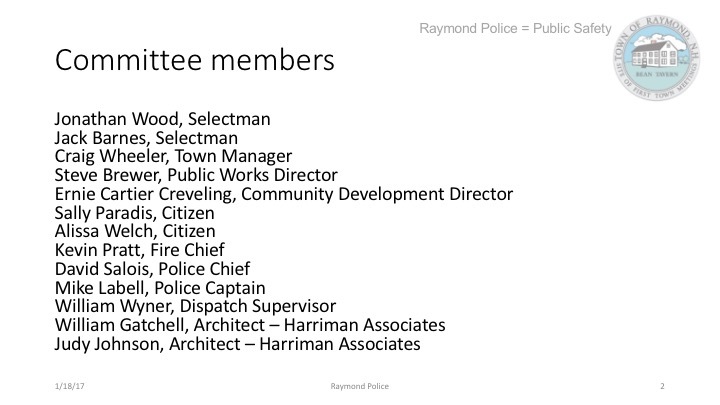 12/6/16 Video released: Video depicting the space needs of the Police Department by Art Wolinsky. 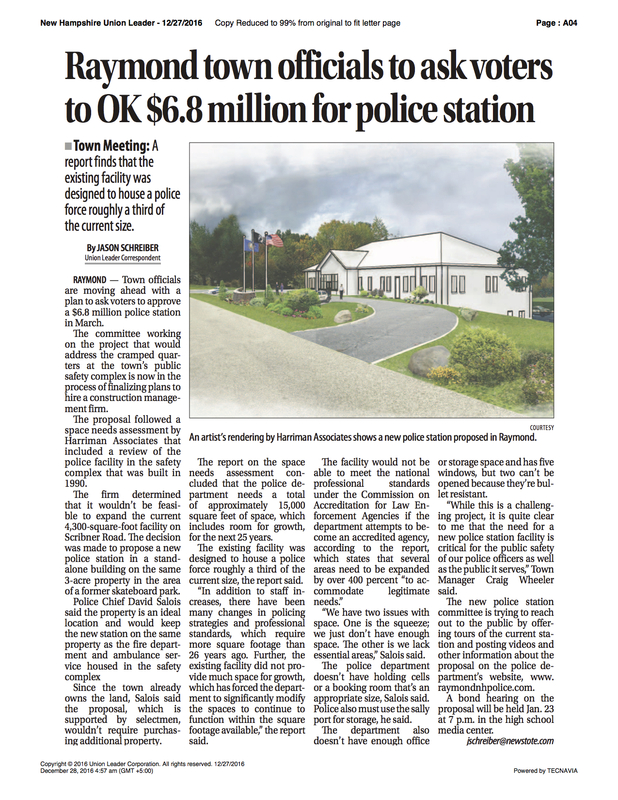 12/28/16 Union Leader Article: by Jason Schrieber highlighting the proposed project. 11/14/16 Presentation: For the Board of Selectmen. 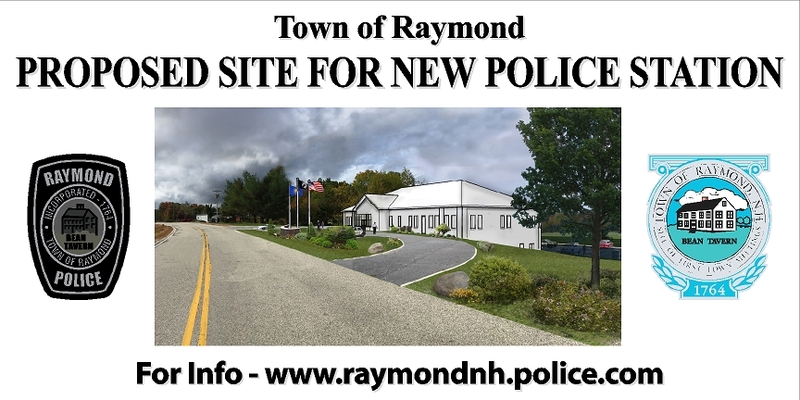 Chief David Salois and members of the New Police Department Study Committee will be making a presentation tonight at the Raymond Board of Selectmen’s meeting on a proposed new police facility. 10/18/16 Member needed: We are looking for a resident to join the committee, if interested please see the above link. 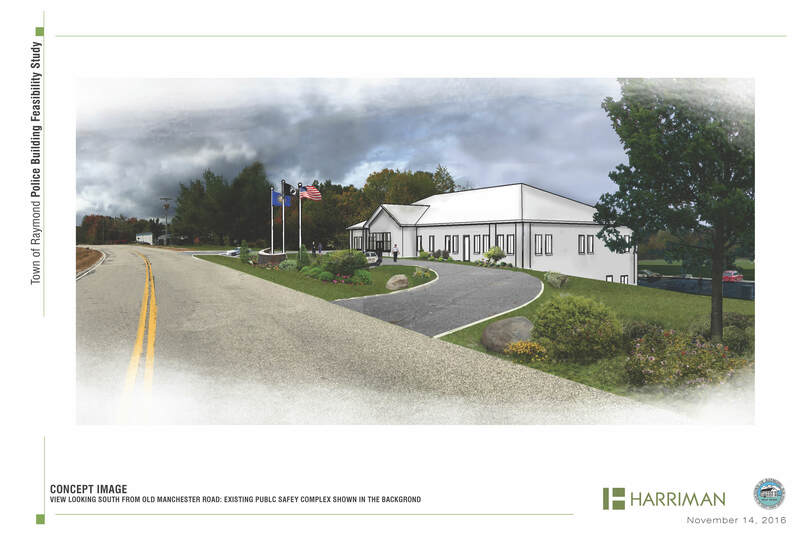 9/21/16 New Police Facility Meeting: Harriman Associates released a report to the committee today outlining deficiencies they documented with the current police station. 9/21/16: Current Facility Evaluation released. 3/8/16: Police Facility Needs / Deficiencies released.